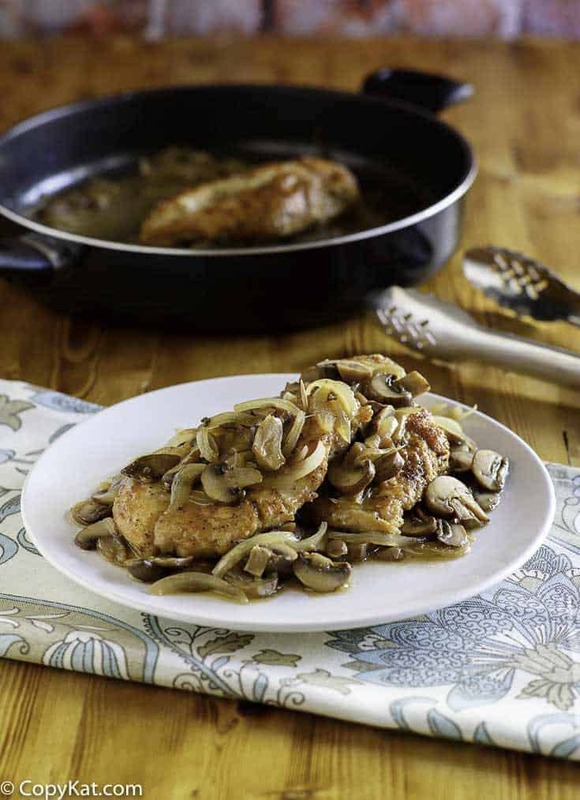 I must make a confession: Chicken Marsala is one of my favorite dishes to make. Olive Garden Chicken Marsala is a true Italian classic, and the Olive Garden Chicken Marsala is likely to be a famous around your house. This delicious dish is made with wine, mushrooms, and chicken breasts. This creates a savory sauce that you won’t want to miss. I like to serve this with polenta, mashed potatoes, or even pasta. I love to order this dish from Italian restaurants. I love the complexity of this dish. The Marsala wine adds so much wonderful flavor that I know you will adore as much as I do. I must share with you a tip that I have for this recipe: Make sure you use Marsala wine that is dry and not sweet. (It comes in two varieties). One of my largest cooking disasters was when I made this dish for someone very special I was dating (someone who would later become my fiancé), and I used the wrong type of Marsala. My wrong choice of wine resulted in a horribly sweet chicken that was inedible. I remember placing the dish on the table. He took a healthy helping, and then took a bite. I looked over and didn’t see the joy on his face. I saw confusion and then came out a semi-polite comment that he liked the mushrooms. I took a bite and thought it was horrible. Being the lady who creates CopyKat recipes makes me feel like I must always prepare a good meal. I was utterly mortified. I asked him to stop eating the chicken and said I would make other dinner arrangements. We ended up having cheese, crackers, olives, and plenty of wine for dinner that night. So please, I urge you to look closely at the label when you purchase your Marsala—the dry variety is the one that you want for this recipe. 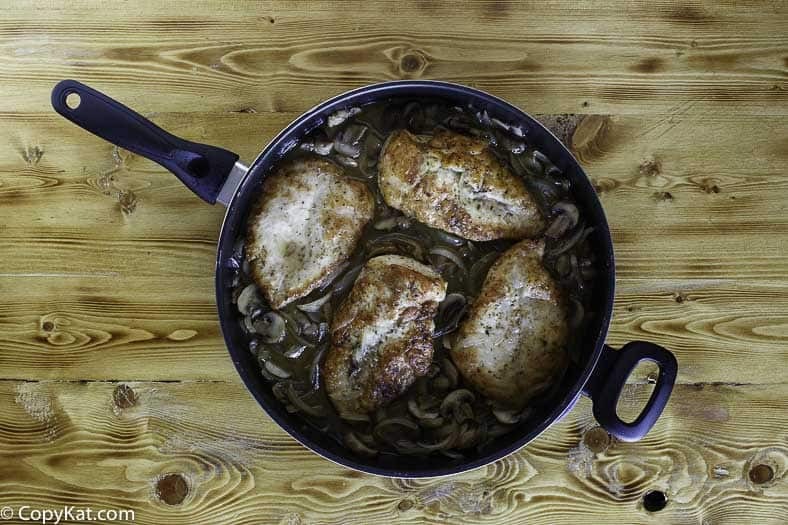 I love Chicken Marsala with onions, you can add the onions if you desire, they are optional. You can find more Olive Garden Recipes at CopyKat.com, the web’s most popular destination for copycat restaurant recipes. 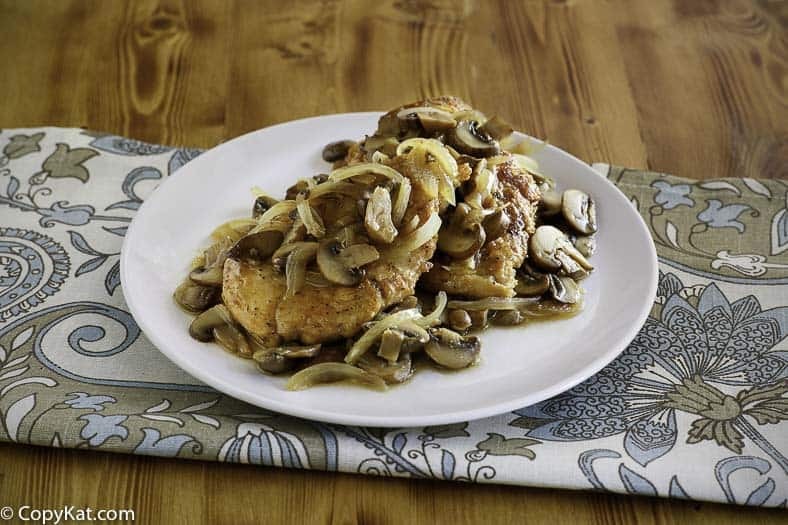 Enjoy the Olive Garden Chicken Marsala when you make it at home. Combine the flour, salt, pepper, and oregano and blend well. Heat the oil and butter in a large skillet over medium heat until bubbling lightly. Dredge the chicken in the flour mixture and shake off the excess. Cook the chicken for about 2 minutes on the first side, until lightly brown. After you turn the breasts to the second side to cook, add the mushrooms and onion (if using) around the chicken pieces. Cook for about 2 minutes more, until the chicken is lightly browned on the second side. Stir the mushrooms. Add the wine, cover the pan, and simmer for about 10 minutes, until the chicken is cooked through.NoteI personally love chicken Marsala with onions, but if you don’t, they are optional. Saw the comments about soy sauce & molasses. Sounds like a splash of teriyaki sauce would do the trick. Yum! Stephanie are you out there? i asked about olive garden marsala sauce in late december it is the original marsala sauce not the stuffed . Sure, I may have missed your original post with the holidays. I think they key here is to figure out exactly what type of Marsala that they use. I understand it is a proprietary wine. I think the recipe and the technique is ok, again the question is to find the right marsala. Someone who worked at Olive Gardens told me it’s Lombardo dry marsala. good but just standard marsala sauce. DOES ANYONE KNOW HOW TO MAKE OLIVE GARDENS RICH BROWN MARSALA SAUCE???????? Do you pound the chicken breast to make them flat? I think it is always smart to pound them a bit if they are of uneven size. It’s not required but can help with the cooking time.